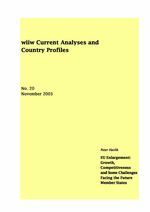 This paper provides an overview of the recent economic performance and an outlook for the EU accession countries of Central and Eastern Europe (CEECs), focussing on growth and productivity catching-up both at the macro level and in the manufacturing industry during the period 1995 to 2002. The observed impressive gains in the CEECs' labour productivity have been associated with stagnating (at macro level) and declining (manufacturing industry) employment, respectively. The expected catching-up after joining the EU in May 2004 will be challenged by the choice of macroeconomic policies prior to EMU accession. The paper discusses some of the dilemmas related to an early adoption of the euro, as well as the CEECs' readiness regarding the takeover of the 'acquis communautaire'. A detailed statistical appendix provides an assessment of the CEECs' income and productivity levels, as well as selected indicators of competitiveness.